CR Solar foreman Trenton Rock installs solar panels Monday in Twin Falls. Bob Sojka talks about coming to the decision to have solar panels installed on his home Friday southwest of Twin Falls. The inverter box is seen at the side of Bob Sojka's house Friday southwest of Twin Falls. A CR Solar installer holds a solar panel Monday in Twin Falls. Solar panels are seen mounted atop Bob Sojka's house Friday southwest of Twin Falls. CR Solar foreman Trenton Rock stages solar panels in preparation for installment Monday in Twin Falls. CR Solar foreman Trenton Rock works on installing solar panels on the roof of a house Monday in Twin Falls. CR Solar employees Jonah Kealamakia, right, and foreman Trenton Rock install solar panels Monday in Twin Falls. TWIN FALLS — A cold wind blew and the sun shone high in the sky as two men walked along the roof of a home in northwest Twin Falls. Lines were chalked out and racking was secured in preparation for solar panels to be installed on the south-facing roof. Solar panels are cropping up all around the Magic Valley in record numbers. With a big demand from residents wanting to produce their own energy, companies from Buhl, the Treasure Valley and Utah are racing to fill orders. The city of Twin Falls has issued 45 solar permits so far this year — a 275 percent increase over 2017, building official Jarrod Bordi said. “This is definitely the most solar permits we’ve ever issued,” he said. The city issued only three solar permits in 2016 and 12 in 2017, totaling 50 residential and 10 commercial solar projects in three years. Why the sudden influx? Installation companies say solar panels are cheaper than they’ve ever been, power costs are rising and a significant federal tax credit could sunset in just a few years. Homeowners with solar panels export power onto the grid when they have excess energy. They pay only for the energy they consume that’s beyond their power generation. But the future of Idaho Power’s net metering program is uncertain as the company works to study the cost and benefits of on-site generation. Depending on the outcome of that study, Idaho Power Co. is likely to change its rate structure for net metering customers at some point in the coming years. The company already separated on-site generation customers into a different customer class this spring. “It’s been recognized that they do use electricity in a different way,” Idaho Power spokesman Jordan Rodriguez said. Gietzen Electric in Buhl has been offering solar panel installations since 2011, but it started a subsidiary this year under the name of Gietzen Solar LLC. The demand for panels has about doubled each year, company officials say. But even with federal and state incentives, solar panels aren’t an easy sell to every Idahoan, said Joey Richardson, project engineer for Gietzen Solar in Buhl. Even last year, people were skeptical, but Richardson hopes the early-adopters will get others to see the light. “They need to see it to believe it,” Richardson said. Bob Sojka, who lives in southwest Twin Falls, is already a firm believer. He chose to install solar panels at his house last year largely for environmental reasons. Sojka embraced supplying green energy to his home. “If I can afford to do something about it, I’m going to do something about it,” he said. Sojka would like to see Idaho complete its transition away from emissions-producing energy sources such as coal. The growing popularity of solar power has meant other solar companies are turning their attention to the Magic Valley. In early spring, Facil Carlson was going door-to-door and asking Twin Falls residents if they’d be interested in solar panels. “I was shocked to hardly see a single home with solar,” he said. Carlson is a senior consultant with CR Solar LLC, based in Logan, Utah, where there is a lot of competition for solar panel installations. Since the company branched into Idaho this year, its installers have done more than 100 installations in the state. “It’s a brand-new market,” Carlson said. Both Gietzen Solar and CR Solar have plans to open offices in Twin Falls soon. Homeowners aren’t the only ones interested in solar energy. Farmers are also finding reason to invest in solar panels. Several farms in the Magic Valley have adopted solar projects to offset the power consumption of their pivot pumps and storage facilities, Gietzen Solar Operations Manager Cat Gietzen said. A 100-kilowatt system can generate savings of around $12,000 per year, she said. Idaho has boasted some of the lowest electricity rates in the nation — but the state is also the fastest-growing in population, said Andy Lund, marketing director for CR Solar. What that adds up to, he said, is more demand on the system and a need for more power. That’s bound to affect system needs and electricity rates. “It may be low now, but it’s not going to be low for long,” Lund said. The fear of increasing rates was a big part of what drove Andrea Graham to install solar panels in her Twin Falls home this year. That’s because CR Solar locks in rates over the length of the contract, Carlson said. The payments are the same as what you’re currently paying for your average utility bill, he said. Estimating the future power usage of the new home, however, is a “stab in the dark,” said Thomas Simms, VP of operations for CR Solar. But adjustments can be made later if calculations are off. Residents can pay off a good portion of their system early with a federal tax credit that allows them to claim up to 30 percent of the cost of the system, Carlson said. The state of Idaho also offers an incentive that allows residents to deduct much of the cost of the installation from their state taxes. In the best cases, homeowners can save up to 48 percent of the system cost with these tax deductions, Carlson said. But the federal incentive will be less for those systems that go into place after 2019, and the tax credits are set to expire after 2021. “With those phasing out, it creates urgency in some respects,” he said. There are many different kinds of loans and financing available for solar panels. An Idaho renewable energy loan program offers a fixed 4 percent interest rate over five years, up to $15,000, Richardson said. And the USDA offers grants for small businesses and farmers for up to 25 percent of the system cost, Gietzen said. Aside from those incentives, solar is becoming more affordable. “Even in the last five years, the cost of solar has gone down about 30 percent,” Lund said. He estimates a small solar system to cover the energy needs of the average three-bedroom, two-bathroom home would cost around $20,000 or so — less, after the tax incentives. The most efficient systems are those that are on a south-facing roof, which gets the most sun and requires fewer panels. East-west facing roofs are more difficult to calculate and are more expensive, Simms said. Battery storage of excess power is usually cost-prohibitive, so most solar customers rely on Idaho Power’s system at least some of the time. 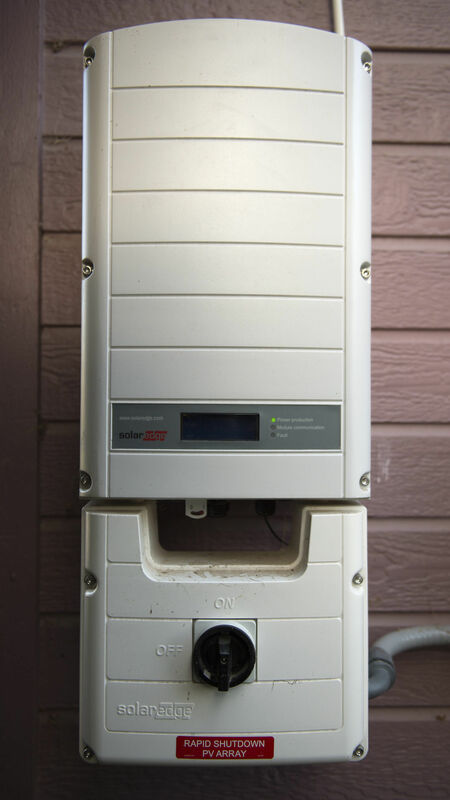 When a homeowner installs solar panels on his or her home, Idaho Power comes and installs a new meter that can measure the excess energy the home’s solar panels send onto the grid. The customer gets credit for energy the system exports. When the sun is down or covered by clouds, the meter measures what the house is using from the grid. Most homeowners with solar panels want to their power generation to be equal to their total power usage. That way, they don’t pay anything to Idaho Power except a $5 monthly service fee. But the company wonders if this billing system is fair. Homeowners who don’t produce their own power pay a special rate for system maintenance, but net metering customers do not. Idaho Power has argued that net metering customers are avoiding their fair share of costs associated with operating and maintaining the electric grid. Idaho Power is studying the costs and benefits of on-site generation and could change the way it works with these customers, company spokesman Jordan Rodriguez said. “This is going to be an open public process, during which we will hear from lots of interested parties and stakeholders,” he said. But some solar power owners are not pleased with this study or its potential impacts. “They’re penalizing people for trying to solve their problem,” Sojka said. He argues that local power generation offsets the need for Idaho Power to create or buy energy from elsewhere. Idaho Power acknowledges this benefit, and will study it, too, Rodriguez said. Despite the uncertainty of net metering customers’ future rates, companies and city officials expect solar power will continue to grow in popularity. “I think you’ll see more commercial buildings getting on board with it,” Bordi said. Solar panels are becoming a common sight around the Magic Valley.